Survivor: South Pacific (2011) - 3rd place, zero jury votes. Received no jury votes to finish third (6-3-0), in Episode 14, "Loyalties Will Be Broken" (Day 39). South Pacific Ep. 1 IC: "Coconut Conundrum"- Shoots baskets, Upolu wins. South Pacific Ep. 2 RC/IC: "Crate Escape" - Helps work the slide puzzle, but Upolu loses. South Pacific Ep. 3 RC/IC: "Hitching A Ride" - Retrieves bags for Upolu, and Upolu wins. South Pacific Ep. 4 RC/IC: "Shoulder the Load" - One of four loaders for Upolu, but Upolu loses. South Pacific Ep. 5 RC/IC: "Pig Out" - Gnaws and spits pork, Upolu wins. South Pacific Ep. 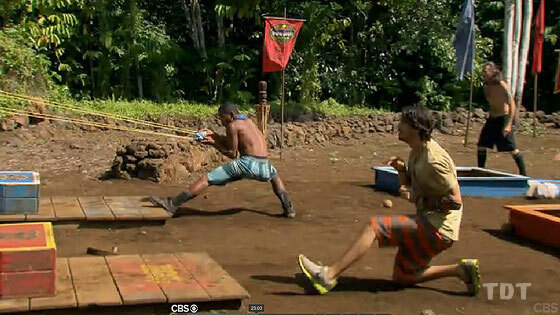 6 RC/IC: "Losing Face" - Works the slingshot for Upolu, but Upolu loses. South Pacific Ep. 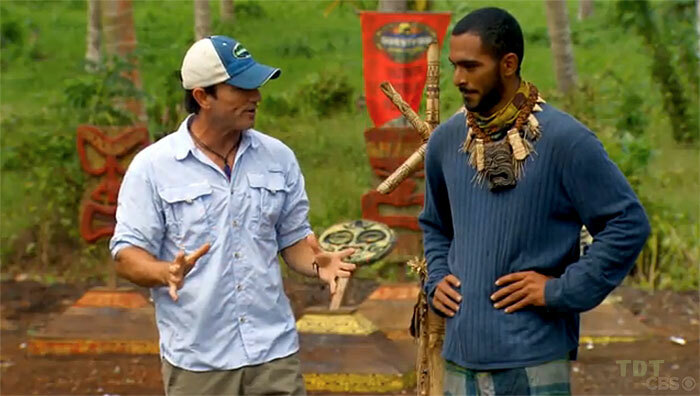 7 RC/IC: "Family Ties"- With Sophie, gets two bags and works final puzzle; Upolu wins. South Pacific Ep. 8 IC: "Coconut Cradle" - Makes final round, last man to drop out (2nd/8). South Pacific Ep. 9 F11 IC: "Get Crackin'" - Eliminated in first round (tie-5th/11). South Pacific Ep. 9 F10 IC: "Bow-Diddley" - One of seven who opted to eat instead of compete (tie-10th/10). South Pacific Ep. 10 F9 IC: "Price on Your Head" - One of five far off of Sophie's winning pace (tie-5th/9). South Pacific Ep. 10 F8 IC: "C.A.T." - With Edna and Rick, eliminated on the first question (tie-6th/8). South Pacific Ep. 11 IC: "Second Chance" - Advances to final round, and Albert wins! (1st/7). South Pacific Ep. 12 IC: "Flip Out" - First person eliminated (6th/6). South Pacific Ep. 13 IC: "Batman Wall" - Tied with Sophie for last place (tie-4th/5). South Pacific Ep. 14 F5 IC: "Teeter Tower" - Albert doesn't drop his stack, tied for last (tie-4th/5). South Pacific Ep. 14 F4 IC: "Lei of the Land" - With Coach, ends up in last, with zero pieces placed (tie-3rd/4). South Pacific, Ep. 5: Finds the idol clue and shares it with Coach, who finds and keeps the idol (Day 12). South Pacific, Ep. 2: Christine Shields-Markoski (voted out, 4-3-1-1). South Pacific, Ep. 4: Stacey Powell (voted out, 7-1). South Pacific, Ep. 8: Keith Tollefson (voted out, 6-6 [6-4 tiebreaker]). South Pacific, Ep. 9 (F11 vote): Ozzy Lusth (voted out, 9-2). South Pacific, Ep. 9 (F10 vote): Jim Rice (voted out, 7-3). South Pacific, Ep. 10 (F9 vote): Dawn Meehan (voted out, 7-2). South Pacific, Ep. 10 (F8 vote): Whitney Duncan (voted out, 7-1). South Pacific, Ep. 11: John Cochran (voted out, 5-2). South Pacific, Ep. 12: Edna Ma (voted out, 5-1). South Pacific, Ep. 14 (Final 5 vote): Rick Nelson (voted out, 3-2). South Pacific, Ep. 14 (Final 4 vote): Ozzy Lusth (voted out again, 3-1). South Pacific, Ep. 14 (Final 4 vote): One vote, from Ozzy. South Pacific, Ep. 14: Received zero jury votes, ended up in third place (6-3-0). Gordon Holmes at XfinityTV.com (8/22/11): "Pre-Game Interview: Albert Destrade"
Rob Cesternino at RHAP (12/19/11): "Post-Finale Interviews with Sophie, Brandon, Rick, Albert, Coach, and Ozzy"
Daniel Fienberg at HitFix.com (12/21/11): "Albert Destrade Talks Survivor: South Pacific"
Dom Harvey & Colin Stone at the Dom & Colin Podcast (3/9/12): "Survivor: South Pacific retrospective with Albert Destrade"
SurvivorOz podcast interview (7/12/13): "Albert Destrade interview"
"Personal claim to fame: I hit my first college home run off of a guy that was a 1st round draft pick. Pet peeves: I have little to no patience for ignorance. People who are uninformed about something, yet insist to be opinionated about it, really irritate me. I also get bothered by mentally weak people. Survivor contestant you are most like: I really like how J.T. managed to forge himself as a leader on Season 18 without being overbearing or bossy whatsoever. He commanded respect and led by example. Why you think you will be the sole Survivor: I know that I possess a unique combination of attributes that would make me a favorite in this game. I’m athletic and very socially adept. I’m calculated and self-aware. Ultimately, if you combine my awareness, physical strength and social calibration, I bring a lot to the table."